Just a few years ago, the city’s traditional afternoon-tea salons were about as lively as the office lunchroom. Now you’ll be hard-pressed to find an empty settee. As the midtown lunch hour has crept closer and closer to two o’clock, it’s become increasingly common to stifle those half-past-noon hunger pangs with a yogurt or PowerBar and save the main event—business meeting, social tête-à-tête—for teatime. After all, who doesn’t love little sandwiches with the crusts cut off ? The Scene: A mix of business types, midtown scenesters, and high-paying hotel guests. Pros: The lobby lounge doubles as a tea venue, so the vibe is a little groovier than you might expect. A vast honey selection ranges from buckwheat to sage to raspberry; pastries are exquisite. Cons: They get fancy with the sandwiches—grilled-veggie wraps, beef tenderloin with celery-root rémoulade—which sort of misses the point. The Scene: Strictly suits. This is, after all, the Peninsula. Pros: Guys will feel comfortable here. Aside from the requisite dainty place settings, there’s nothing ladies-who-lunch about it. The scones are worth an Atkins slip-up. Cons: The limited tea selection lacks inspiration and includes few decaffeinated options. The Scene: The straight-backed set whispering about So-and-so’s latest indiscretion. Pros: The Rotunda is a dazzling throwback to Old New York. Tea cozies keep your pot hot no matter how long you linger. Cons: You can’t really serve yourself, and it can be annoying to wait for your waiter to pour more tea. Scones look—and taste—like something out of a Pillsbury-dough can. The Scene: Tourists. And it’s a big room, so expect a lot of them. 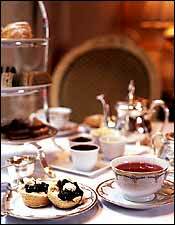 Pros: Two tea menus are offered: a traditional afternoon tea and a more expensive version with smoked salmon and caviar. There’s also a table filled with irresistible full-size desserts—for $9.75 each. Cons: See “The Scene,” above. Also, the sandwiches, served straight from the fridge, got soggy when the bread began to thaw. The Scene: All types, with a concentration of well-heeled sippers slouching ever so slightly in comfy chairs and settees. Pros: These are the best sandwiches on the afternoon-tea circuit—and seconds are complimentary. A tea sommelier helps you choose among more than 25 green, black, oolong, and herbal teas. Cons: While some might find it a soothing addition to a highly civilized ritual, we could do without the harp. Before you lift a cup, digest St. Regis tea sommelier Elizabeth Knight’s tips on afternoon-tea etiquette. 1. Don’t confuse afternoon tea with high tea. The first is an elegant three-stage snack with tea; the second, a frumpy early supper. 2. Eat the scones first. Break off little pieces of your scone. Spread the jam on, then the clotted cream, one bite’s worth at a time. Move on to the savories and sandwiches; the sweets are to be eaten last. 3. Pinch the teacup handle. That’s more traditional than putting your finger through the loop. 4. Never leave your spoon in your cup.